Use only as intended. See Safety Measure document included with product. Ensure ratchet is in good working order prior to each use. Check ratchet for cracked or bent parts. Check entire tie-down for damage and proper working operation. Keep ratchet mechanism clean to avoid rust and ensure smooth operation. When not in use, keep ratchet in a dry area where it cannot become damaged or inoperable. SAFETY MEASURES – use only as intended. Quickloader/Wessel Industries LLC or its agents is not responsible for the attachment or the installation. It neither guarantees, nor will it be liable for any damage resulting from its attachment or improper use. Warranty information available upon request. Warranty void if webbing or hardware is damaged, cut or worn. The cargo weight is to be evenly distributed. Protect the webbing against friction, abrasion and damage from load with sharp edges by using protective sleeves and/or corner protectors. Do not throw the Quickloader across the cargo as it may result in serious injuries. Quickloader should not be dropped or left on the ground where vehicles may damage the metal fittings. Tension must always be applied using the handle to secure the goods. The Quickloader retractable spring mechanism does not produce enough tension alone to secure any load. Therefore apply a hand force of approximately 30 lbs (15 kg) on the handle to achieve a recommended pretension on the webbing. Ensure that there is a minimum of 2 and a maximum of 4 turns of webbing on the ratchet spindle. After fastening the Quickloader the handle arm should be put back into its original position. Make sure that both of the locking plates (top on the handle and bottom on the base) slides fully into cogwheel. Quickloader shall not be overloaded, neither by exceeding the maximum handle force of 30 lbs (15 kg) or by exceeding working load with too heavy cargo. Mechanical aids such as levers and bars as extensions are not to be used to increase the tension. 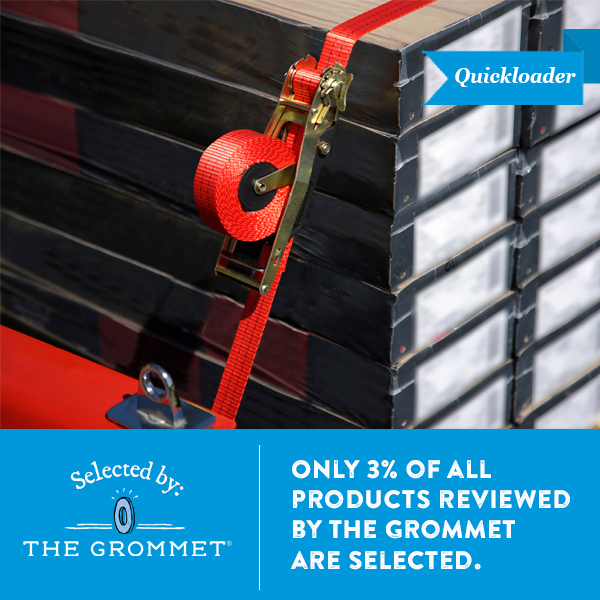 The Quickloader’s rating (Load/Breakforce) should not be the only determining factor of securing the load. It is vital that the anchoring points and fittings be equal to or greater than the load being secured. Use your hand as a brake on the webbing spool during retraction to avoid the hook and webbing returning at a high speed. A visual inspection before and after each use is recommended. The webbing is suitable for use in temperatures ranging from -40°F (-40°C) to 194°F (90°C). Changes in the temperature during transport may affect the pretension on the webbing. Check the tension force after changes in the temperature. A temperature below freezing point may affect the retractable function of Quickloader if the webbing contains moisture. Before attempting to unload any cargo Quickloader is to be released so that the cargo can be lifted freely. During unloading, care should be taken to ensure proper stability of the load before releasing the Quickloader’s tension. This is to avoid the cargo falling and causing damage. When securing the cargo, the Quickloader shall not be placed against a corner or a sharp edge. Quickloader should not be used if the webbing is knotted. The strength of the Quickloader may not comply with the break force if it has tears, cuts, nicks, breaks in load fibers, deformed parts, been in contact with chemicals, cracks, corrosion, or pronounced signs of wear. The webbing may discolor the load. To ensure that Quickloader continues to operate as intended, it is recommended to keep the unit clean. Lightly lubricate the cogwheels and store it in an environment which is dry and above freezing point when not in use. Do not to open the plastic spring box. Attempting to open the spring box may result in serious injuries. Any attempt to open will immediately void all Warranties and Liabilities. Quickloader is subject to normal wear and tear. The capacity stated on the label is the capacity for a new and unused product. Degradation of the stated capacity may occur after use. Please note: The driver is responsible for securing the cargo according to applicable laws, rules and regulations. For more details and information you may visit http://www.quickloader.com. Quickloader is registered trade mark.